blood simple:Term coined by Dashiell Hammett describing the addled, fearful mindset of people after a prolonged immersion in violent situations. That was the definition, according to the famous mystery writer, who made the phrase common vernacular in his novel Red Harvest and which the Coen brothers gave new life to in their feature debut Blood Simple. The great Chinese filmmaker Zhang Yimou specifically cites Hammett's definition in the trailer for his remake of the Coens' film, A Woman, a Gun and a Noodle Shop, which opened in the U.S. last year. As big a fan as I am of both Zhang and the Coen original, I'm afraid that the adjective addled turns out to be very appropriate, both for most of the characters in Noodle Shop and in Zhang's approach to the film as well. Obviously, the setting for A Woman, a Gun and a Noodle Shop no longer takes place in Texas, but its time period has been transferred as well, to an nonspecific feudal period in China's past where the title weapon actually is a novelty that comes into the hands of the noodle shop owner's wife (Yan Ni) by a Persian merchant (Julien Gaudfroy) passing through their village selling his wares. Yan Ni's character, who never gets a first name as is credited merely as Wang's wife — Wang (Ni Dahong) being the noodle shop owner — bears absolutely no resemblance to Frances McDormand's Abby in Blood Simple. While the women in both films may be cheating on brutish, abusive husbands with their spouses' employees, Wang's wife's portrayal comes off as scheming, loud and boisterous and shows little regard for anyone, including her lover Li (Xiao Shenyang), one of the most addled of the addled characters I referenced in the lead. In fact, the entire tone of Zhang's film plays a lot like the portrayal of Wang's wife: It's a frenzied, manic farce that seems more like Zhang is paying homage to the Coens' style in Raising Arizona more than Blood Simple, except Raising Arizona works. It takes about a third of the 90-minute film before Noodle Shop begins to resemble Blood Simple's plot very closely. After a group of policemen arrive to investigate the cannon that was fired by the Persian merchant (who looked about as Persian as Eddie Albert in the film version of Oklahoma!, though it might have been more interesting to follow his character and see Zhang try to adapt that Rodgers & Hammerstein musical landmark to a Chinese setting). Instead of Wang hiring a private eye to find out if his wife is cheating on him, one of the policemen, Zhang (Sun Honglei), informs him that he's being cuckolded because he stumbled upon Li and Wang's wife accidentally. Wang explodes, furious at the news, and offers Zhang some money if he'll kill the both of them for him. Wang will leave town on a fishing trip for an alibi. Unlike the great M. Emmet Walsh's investigator in Blood Simple, who was as entertaining as he was sleazy and dangerous, Zhang's demeanor remains stoic throughout. So much so that he seems out of step with all the loony characters and farcical goings-on that surround him. The plot details don't make sense either. Since there aren't photos in the era depicted, he has to prove he "killed them" with pieces of Li and Wang's wife's clothing with slash marks. Why he panics to retrieve these for fear they'd implicate him doesn't compute the way the doctored photos and dropped lighter did in Blood Simple, let alone cause Zhang to kill a minor secondary character and forget his pipe where he buried him, making him fear that losing that will finger him as Wang's killer. At the film's very end, which tries to duplicate Blood Simple's ending exactly with Wang's wife telling Zhang to tell Wang she's not afraid of him anymore, Zhang lets out a laugh that seems completely out of place for his character in Noodle Shop when it was the perfect punchline in the Coens' film. To make matters worse, Zhang keeps laughing as he sees the approaching drop of water as opposed to the look of horror on Walsh's face in the original. The visuals, especially scenes shot outside, contain very vibrant colors, so vibrant in fact that it makes the film look artificial, which might be appropriate since its slapstick approach and one-dimensional characters seem just as fake. Also, as much as I complain about film scores that step on the dialogue and action, this film actually could have used one. It doesn't have one and perhaps if it had some music to match its zaniness, all its disparate elements wouldn't seem so incongruous. I've never been more disappointed by a film made by Zhang Yimou, even though when I first heard of this idea it excited me, I should have stuck to my usual rule: Don't remake great films. It hardly ever pays off. Perhaps this is karmic payback to the Coens for when they made the unnecessary and terrible remake of the classic Alec Guinness comedy The Ladykillers. Don't try to make a new version of a film that was damn near perfect in the first place. It seems odd that it happens to the Coens now when they remake a flawed but hardly untouchable film such as True Grit and end up with a remake that exceeds the earlier version in every conceivable way. 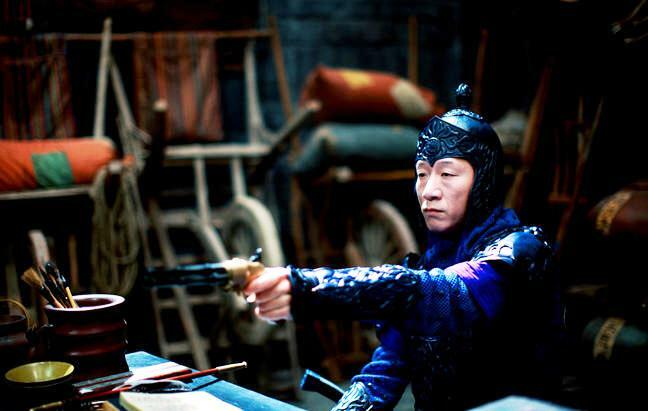 I realize that Zhang Yimou operates under terrible repression, but I so wish he could (or would) escape and get back to making those films that earned him his reputation such as Ju Dou, Raise the Red Lantern and To Live and abandon the Crouching Tiger-type films such as Hero and Curse of the Golden Flower and especially complete misfires such as A Woman, a Gun and a Noodle Shop. Not my favorite film by Zhang either, but I kinda liked it. With the film noir blogathon on the way, it made me think about the concept of film noir in period settings, along with Anthony Mann's Reign of Terror, which takes place during the French Revolution. Zhang's film is listed at the Film Noir Foundation website. The film's original title is A Simple Noodle Story, and there was a musical ending that the producers deemed would not be appreciated by U.S. audiences, that unfortunately isn't a DVD extra either. The dead characters reportedly come back long enough for a little song and dance.